← Does ‘Rotary’ always have to be about food? Senlac honour the haggis – and their stomachs! 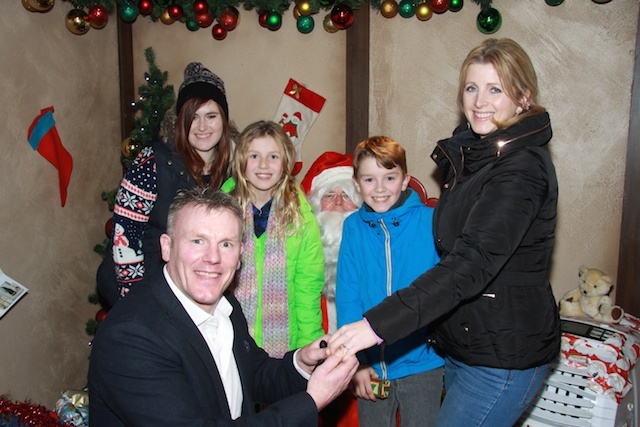 Rotarian Roger Hext, a member of RC Maidstone was doing ‘Santa duty’ at their grotto – (they don’t say exactly which store). One of his visitors was Graham Jones and his partner Fiona Robertson and their children. The children had had their gifts, and that also, as you can see above, there happened to be a photographer present of Graham placing the ring on his betrothed’s finger – Arrr, nice! Well done RC Maidstone, Maidstone’s ‘senior’ club, but sometimes appears to be slightly media shy, so nice to hear from them. Also nice to read that this ‘story’ got good coverage in the ‘Kent Messenger’ and we assume all the other little Messengers too. The couple plan to marry this year, and have invited Santa Roger as a guest. Surprised? He nearly ate his beard! You never know what will happen when you are on active service as a Rotarian – even in Maidstone.